From: New York Dachshund Rescue and the Westchester Shore Humane Society in Harrison, N.Y.
After months of deliberation, I rescued a dog from the Humane Society. Meet Phineas (Phin for short), a black-and-tan, 14-pound dachshund, part wirehair, part smooth-coat, part mini, part standard-size. 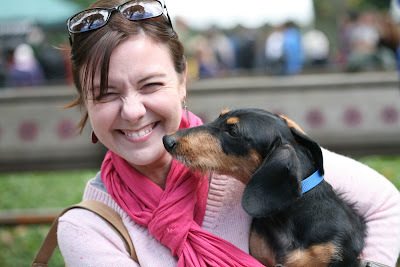 About two years ago, we lost our dachshund, Sebastian, and it was a heartbreaking event for my entire family. We really loved that little guy, and for the first time I spent a year without a dog in my life. It took me about a year before I could mention Sebastian’s name without crying and begin a new chapter in my life with canines. And just as I decided I was ready, Phineas appeared through the help of New York Dachshund Rescue and the Westchester Shore Humane Society in Harrison, N.Y. I woke that morning as if it were Christmas, eager to meet Phineas and see if we were a match. I knew in just a few minutes that this guy was the one for me—now if only dating were so easy (and I suppose it is with the right guy!). My newly retired mom, a great dog lover, met me at the Humane Society and agreed to watch him that weekend while I was out-of-town at a wedding. I had spent months reading Cesar Milan’s books and plowed through many of Temple Grandin’s, too, in an effort to understand how dogs think and how to give them the very best lives possible by giving them what they need, not what we need. Phineas and I just celebrated his second birthday (given that he was about a year old when I adopted him, we just made his adoption day his birthday) and our first anniversary. In that time he has shown me that waking up ecstatic about life is the only way to live, carving your own path in life is fun, and realizing the gift of this moment requires letting go of the sadness we’ve felt in past moments. He appreciates the sunshine where and when we can get it (he is not a fan of the rain), and he lets the rhythms of nature determine when to eat, play, and sleep. The greatest lesson he’s taught me has very much to do with his past. About a year ago, a policeman found Phineas in an abandoned building, lonely, cold, and hungry. He had a tag on, and the policeman picked him up and went to the address on Phin’s tag. He must have anticipated that the little guy lost his way and would be so glad to find his way back home. Instead, the policeman found a boarded-up home in very bad condition, and it looked as if no one had lived there in a very long time. He brought Phin to the Humane Society, and they contacted New York Dachshund Rescue. The rest, as they say, is history. It must have been a terrible feeling to be dropped off on the side of the road, left behind to fend for himself. Or worse, I guess it’s possible that he ran away from a terrible home. I can’t let myself think about this idea too often because I will be a puddle of tears in a matter of seconds with that thought rattling around in my head. Phineas, however, has found, learned, and shared a powerful lesson from his past: love heals. I’ve often heard it said that time heals all wounds, but I actually think love is a more complete and efficient healer than time. Time is a finite gift; the amount of love we can take in and give away is infinite. The only limit love knows is our desire to give and receive. Phineas can never get enough and can never give enough. He’s a wonderful role model of courage and bravery, for believing that life can always get better no matter how far down in the doldrums we are. Love is what helps us make that journey. A year ago, he was starving and lonely, abandoned in the woods. Today, he sleeps in a warm, down-filled bed in a (cozy) penthouse apartment on the upper west side of Manhattan, has a bottomless bowl of organic food, and laps up buckets of overflowing love that are showered on him every day by me, his friends (human and canine), and even random strangers on the street who fall in love with him on sight just like I did. He let go of his past and moved on so that he could appreciate all the love available to him in his new life. We should all be as appreciative as he is of the gift of another day. And we can be. All we have to do is give love, receive love, and revel in the exchange. This is the kind of profound lesson that a shelter dog can teach if only we give him the chance.